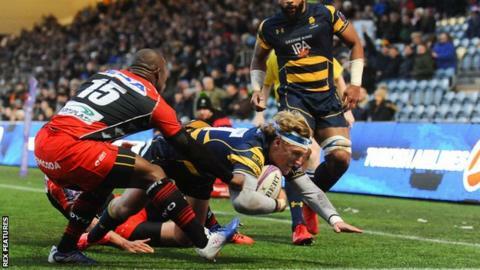 Tom Howe scored two tries to help Worcester claim a second win in this season's Challenge Cup as they beat French side Oyonnax at Sixways. They led narrowly at the break through tries by Howe and Luke Baldwin before stretching away in the second half when Howe crossed for a second time. David Denton then went over with four minutes left to earn a bonus point. Oyonnax, in touch after Hika Elliot's try, only managed a Christopher Ruiz penalty in the second half. It was a third consecutive defeat in the competition for the French side, who remain bottom of Pool 5. But Worcester, who recovered well from last week's Premiership home defeat by Sale, are well in touch with leaders Connacht. Warriors: Howard; Howe, Hammond, Stelling, Humphreys; Olver, Dowsett; Bower (capt), Taufete'e, Milasinovich, Phillips, Barry, Taylor, Durutalo, Denton. Not used: Alo, Fa'osiliva, Shillcock. Oyonnax: Tian; Muller, Lasmarrigues, Veau, Giresse; Ruiz, Hall; Vartanov, Elliot, Mirtskhulava, Kerry, Njewel, Barba, Taieb (capt), Fa'asavalu.